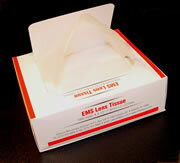 Please see listing in General Preparation Supplies. This ruby-red transparent tape is for use in opaquing, stripping, and edging on film materials. 3" core. Photo-gloss spray adds high gloss finish and permanent protection to the photo. It enhances highlights, increases contrast, protects prints from dust, fingerprints, and water. Excellent adhesive for all paper pasting and mountings of drawings and photographs. It is also used to adhere specimens to SEM Stubs. 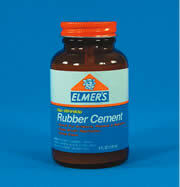 Any excess cured cement can be easily removed. 4 oz bottle comes with a brush in the cap. This is a pressure-sensitive mounting material. RDM is a microthin, clear Mylar® film coated on both sides with an adhesive; specially formulated for photographic purposes. This "delayed-set" adhesive allows for repositioning of prints before providing a permanent bond. No heat is needed. The Mylar® base will not absorb moisture or change its characteristics through time; thereby it eliminates the common mounting problems that are experienced with other mounting materials. RDM sheets are made ¼" oversize which eliminates alignment problems and makes it easier to use.